Note two things: First, that the author’s moron’s feeding table serves as our backdrop and, second, that the author couldn’t even be bothered to take a decent photograph with his dolt’s telephone. After that note that Mario Soto is throwing the ball at Al B. Sure. Sure, Al B. looks self-impressed right now, what with his album sales and Wikipedia entry of Cistullian breadth, but what happens when Mario Soto hits him in the neck with a baseball? What then? When Sartre called us “useless passions,” he wasn’t talking about this, that’s for damn sure. 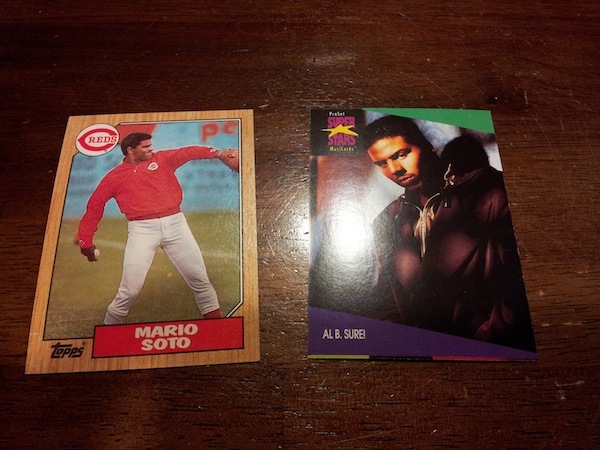 We hoped you liked reading Is Mario Soto Going to Throw the Ball at Al B. Sure? by Dayn Perry! I Will Spend the Day Tracking My Recently Purchased Cap! Surely Al B. too pissed about the absence of the exclamation point after his pseudosurname to even notice Soto, Dayn.